The University of Wyoming is reaching out to make health care more accessible to the state’s many rural residents. Two years ago, UW’s Department of Electrical and Computer Engineering (ECE) donated nearly $11,000 in equipment to establish a remote “telehealth” clinic, which connects patients in Farson, via Internet, to health care professionals in Rock Springs, Laramie and Cheyenne. Since that time, the Eden Valley Telehealth Service Clinic has provided services to 13 patients, including one trauma burn patient, one trauma cardiac patient, a medical visit for influenza and a number of patients with sore throats, says Mary Anne Mines, a volunteer emergency medical technician at the clinic. Telehealth involves physicians using interactive video and/or store-and-forward technologies to treat patients remotely. Using interactive video, medical specialists can directly communicate with their patients who are in other locations, using technology and specially adapted medical equipment. The Farson-Eden area, with a population of about 600, is located in Sweetwater County and about 40 miles north of Rock Springs, the location of the nearest hospital. The Farson-Eden area has no full-time physician but, rather, relies on a chiropractor from Afton who visits the area once a week and a part-time physician -- who actually lives in the area, but works at the Lander Valley Medical Center. That physician is only available in the Farson area once every 10 days, Mines says. 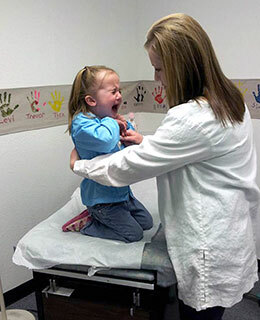 Wyoming’s low population density, large geographic size, travel concerns due to inclement weather and a shortage of primary care and specialty physicians presents a significant challenge for health care accessibility for the majority of the state’s residents who live in isolated communities. The donated UW equipment -- a computer, vital signs monitors, EKG probe, thermometer and stethoscope -- provided the Eden Valley clinic necessary assets in April 2013 to begin telehealth services, Mines says. Mines says anything from routine sports physicals to X-rays are other services that potentially could be offered via telehealth services. In addition to ECE, project partners include UW’s College of Engineering and Applied Science, the residents of Eden Valley, United Way of Southwest Wyoming, the Wyoming Health Information Organization and the Wyoming Telehealth Consortium. Through this collaborative effort, southwest Wyoming partners interact with other telehealth users, other telehealth networks and telehealth service providers. Since it has been available, the telehealth clinic has provided the Farson-Eden area a much-needed service. Dale Newland was one such patient who benefited. In 2013, Newland suffered serious burns while trying to fix his water heater at his home. Rather than drive to the hospital, he attempted to care for the burns himself at home. When his pain worsened and large blisters formed on the back of his fingers on his right hand the next day, he went to the telehealth clinic for help. Mines connected him remotely with a doctor at a burn center in Salt Lake City. The burn doctor instructed Mines to cut away all of the blisters and dead skin, and prescribed a special ointment to help Newland’s wounds heal. Newland says his hand began to heal within four days, and he was fully recovered after a month. While Newland’s experience was a positive one, more telehealth services are needed in Wyoming because the state has the lowest ranking for the number of active physicians: 1.94 per 1,000 residents. The national average is 2.81 per 1,000 residents, says Suresh Muknahallipatna, a UW professor of electrical and computer engineering. What’s more, approximately 70 percent of physicians in Wyoming are located in five of the state’s 23 counties, according to 2012 data collected by the American Association of Physical Therapy Specialists, Muknahallipatna says. “In Wyoming, there are only 45 specialists dealing with orthopedics and two with their only focus on rehabilitation. They (two in rehabilitation) are in Laramie and Casper,” Muknahallipatna says. This fall, the ECE hired a new faculty member, Assistant Professor Domen Novak, to help with collecting data on telehealth services provided by the Farson-Eden area clinic. Usage statistics, failure rate of equipment and ease of use are the primary focus of data collection, Muknahallipatna says. “We wanted to test this equipment in an actual environment and see how well it works so we can get some reasonable data that can be used by our department in future proposals to NIH (National Institutes of Health) and NSF (National Science Foundation),” Muknahallipatna says. One grant proposal, focused on remote rehabilitation using robots, will be submitted to NSF in December. Novak, along with Muknahallipatna, ECE Head John McInroy and Amy Banic, an assistant professor of computer science, is heading the NSF grant. Banic heads the NIH grant effort, which also focuses on remote rehabilitation using robots. That grant request will be submitted in January 2015, Muknahallipatna says. 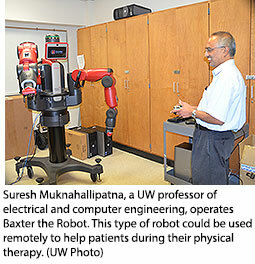 Robots can be used remotely to assist patients with their physical therapy needs, he says. This robot technology has an estimated $800 million impact, according to Manufacturing Institute and PricewaterhouseCoopers (2014), Muknahallipatna says.